Students at virtually every college campus need to access public transit to navigate the campus, its surrounding community or simply get to class on time. Knowing this, it seems logical that the campus ID that a student already carries also double as a transit ticket. The unfortunate reality, however, is that the integration of transit functionality on campus cards has been anything but straightforward. Despite the hits, industry representatives suggest there have been as many or more misses when it comes to finding a solution to the campus card transit integration. There is no denying that the campus card has a long history in transportation. Almost from their inception, IDs have been flashed at bus drivers as students climbed aboard in cities across the country. At the onset of these programs, simple possession of the card was sufficient to get a ride. As costs and accountability concerns surfaced over time, stickers and other visual validation tools were incorporated. From there, the need for automated reporting and stronger validation drove the migration from visual inspection to card reading and database verification. Then, with the advent of cellular and wireless connectivity, transit authorities were able to take fare collection processes from end-of-day compilation to real-time authorization. For campus-operated transit systems or public transit systems offering unlimited ridership options for students, these solutions continue to function well. In many locations, however, it does not suffice. Metropolitan areas with large public transit systems rely on automated ticketing and fare collection systems to serve millions of riders each day. These systems frequently use a fare card with a specific ID technology that powers the system and facilitates the payment. Over the past decade, contactless has emerged as the technology of choice in cities like Chicago, New York, Boston, Atlanta, San Francisco, Seattle, Las Vegas, Los Angeles…and the list goes on and on. Herein lie the opportunity and the challenge. Imagine a campus in a city with a contactless transit system that has recently implemented a contactless student ID card. Lets call it City U. City U’s president uses her transit card and is impressed with its ease and speed. She calls the campus card manager excited about the new contactless CityUCard. She has heard the prevailing mantra of ‘one card,’ and instructs the manager to ‘merge these cards.’ So begins an odyssey that could devour the next year of the manager’s life. The ideal vision for student transit fare collection is to have it be an integrated part of the campus card that the students already carry. If done well, the inclusion of transit could be one of the most valuable services provided to students. Beyond the tangible benefits, Winkelman suggests that transit programs can also help to foster the university’s relationship with the local community. “In some communities, the increase in traffic associated with university students can be a sore spot with local residents,” he explains. Also at the heart of transit functionality is the added value it can provide for students both in terms of cost and convenience. “Transit on the campus card is a convenience to students, and it helps promote use of public transit over personal vehicles, which can reduce parking issues and carbon emissions,” says Fred Emery, director of OneCard sales at Heartland. 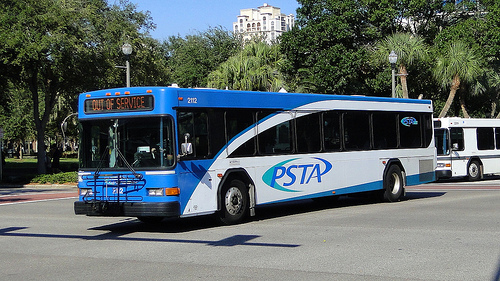 Partnering with a local transit agency can also help defer the cost of cards for the university. “Costs can be shared for the cards which can help reduce campus supply costs,” he adds. The other notable benefit of transit on the campus card is that it eliminates the need for students to carry a second, transit-specific credential. “Can a student carry two cards? Yes, of course, but a combined credential allows them to more easily realize student transit discounts and the campus to better verify who receives those discounts based on current student status,” says Emery. Dan Gretz, senior director of product marketing at Blackboard, agrees that a single card benefits all parties. 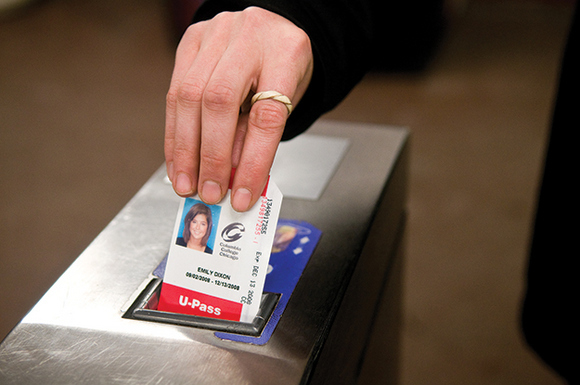 “Students enjoy the convenience; universities relieve the administrative burden of separately issuing transit passes; and transit agencies have third-party issued cards work in their system,” he explains. Though most agree it can be a great fit, the transit and campus card combination has proven a challenge. Technical, financial, logistical and political issues have all served to confound well-intentioned efforts. One of the larger issues universities may face when trying to implement transit is that the campus might be using a different card technology than the local transit agency. “We have seen various transit companies use MIFARE or DESFire whereas a university may have iCLASS, prox or mag stripe,” says Emery. Not surprisingly, the fragmented nature of many transit systems makes it difficult to navigate. “Compounding the challenge even further is that transit projects often require multi-modal support – train, bus, etc. – and involve multiple jurisdictions in the decision making,” adds Staples. Returning to our City U example, lets say the campus implemented an iCLASS contactless card, but the public transit agency is using MIFARE. City U’s president has no way to know the difference. She only knows that the transit and campus cards are both contactless and expects progress. Moreover, our City U president will expect the card office manager to sway a single decision maker at a single transit agency. The reality may be, however, that dozens of decision makers across multiple transit entities – perhaps bus, train and light rail – would have to buy in.